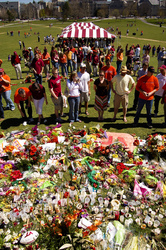 32 stones like this - one for each of the deceased - are arranged in a semi-circle in front of the largest memorial, on the drillfield in front of Burruss Hall. 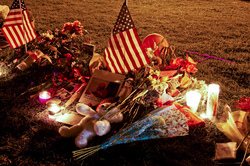 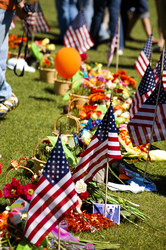 Mementos and flowers at the intermediate memorial. 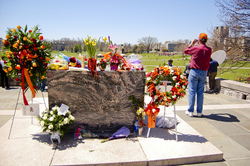 View of the crowd and flowers on the drillfield from the intermediate memorial.